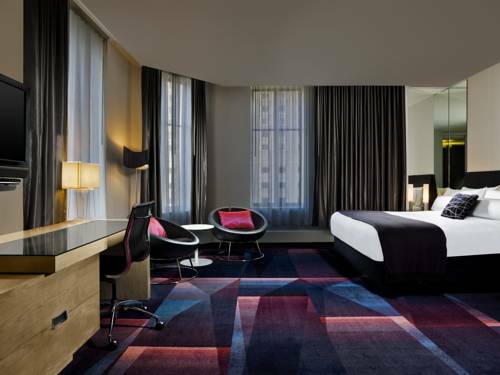 Discover the ideal blend of modern luxury, glamorous history and convenience at W Minneapolis - The Foshay. Set in downtown Minneapolis, within the historic Foshay Tower, our upscale hotel skillfully merges Art Deco decadence with modern urban chic. Take in 360-degree views of the city from our 30th Floor Observation Deck. Enjoy world-class dining at Manny's Steakhouse. Stop by our trendy, 1920s-style Prohibition Bar on our 27th Floor for cocktails in a high-energy atmosphere, or mingle and dance in our hip Living Room. Work out in our FIT Gym, or reserve in-room spa services. Explore our stylish event space for your next special occasion or meeting. Walk to an array of attractions, shopping, dining and nightlife, just steps from our doors. Enjoy our WHATEVER/WHENEVER service; our staff will work tirelessly to fulfill your requests. W Minneapolis - The Foshay offers an unforgettable lifestyle experience for today's discerning traveler. Manny's Steakhouse: "Ranked as one of ""The Top Steakhouses in the World,"" Manny's Steakhouse is located in W Minneapolis - The Foshay. Savor USDA-Certified, dry-aged, center-cut beef and a delicious full menu, along with a 300-bottle wine list. Reservations are required. The Living Room: Walk into our gorgeous lobby and you'll immediately feel our trendy Art Deco/modern chic vibe. Step into our swank lobby bar, The Living Room, to enjoy artisan cocktails, a live DJ and a dance floor. Prohibition Bar: Take in 360-degree views of downtown Minneapolis from our speakeasy, Prohibition Bar, located on the 27th Floor. Step back in time amidst Art Deco decor of the roaring 20s as you sip cocktails in our vibrant, hip bar. Also available for private rental.